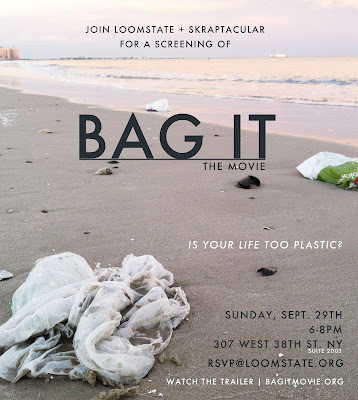 We are hosting a special screening of Bag It the movie in New York with Skraptacular, a non-profit that educates kids and teens (and, really, adults too) about waste minimization by transforming trash and recyclables into art pieces. NYC is on it's way to banning or taxing plastic bag use (we hope! ), so we felt this was a great video to show to raise awareness on the issue of disposable plastics. Before the screening, we invite kids (13 and under must be accompanied by a guardian) to come transform their old tees into reusable school tote bags, plus other DIY crafts (event details). RSVP@Loomstate.org.